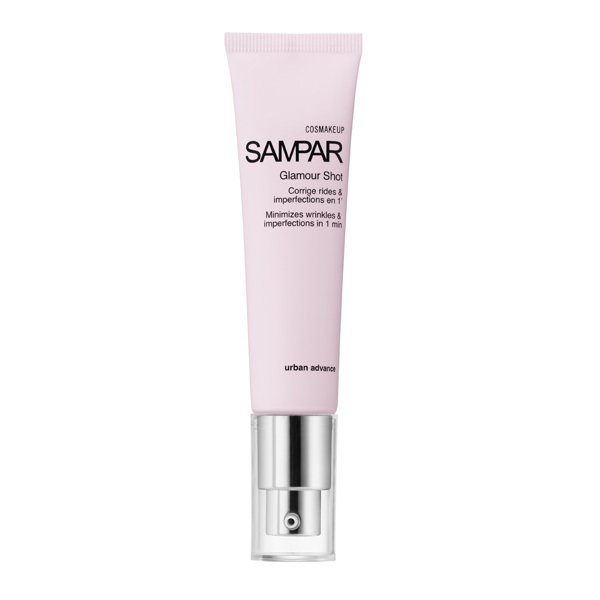 What's Cosmakeup Range In Sampar ? Blurring the lines between skin care and make-up..
MissionA cream with the results of make-up? Must be magic! Glamour Shot is the 1st transparent foundation to be applied over your daily moisturizer. Watch unwanted shine, fines lines, pores, redness and blemishes fade away in just seconds. Results: Wrinkles are visibly corrected. The skin texture is smoothed, and the complexion is matte. For an all-natural, faultless and make-up-less foundation: moisturize your skin with the adapted product. Then apply a small amount of GS and evenly distribute while smoothing, starting from the inside to the facial contours. For an all-natural, faultless foundation, with make-up: moisturize your skin with the adapted product. Then apply a small amount of GS and evenly distribute while smoothing, starting from the inside to the facial contours. Let dry. To finish, apply your usual blush. For a more detailed make-up routine: moisturize your skin with the adapted product. Then apply a small amount of GS and evenly distribute while smoothing, starting from the inside to the facial contours. Let dry. Next, apply your powder foundation. Put on finishing touches with your blush. 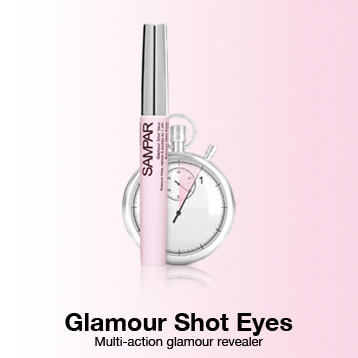 SAMPAR Hint: Treat yourself to Glamour Shot at any time of day, even over make-up, for a quick pick-me-up. HQA microlens, new generation soft focus, reduces the appearance of pores, smoothes and mattifies the skin. Oat extract provides an optimal and immediate lifting effect. Encapsulated hyaluronic acid improves skin density and fills in wrinkles for a long-term effect. Urban Advance Complex, a powerful alliance of 3 active ingredients (shea butter serum, mint endorphin and probiotic sugar), acts as an anti-oxidant shield, neutralizing any cutaneous imbalances linked to pollution, strengthens the skin's natural defenses and shocks the skin back to life on a cellular level. In 1 minute, this multi-action glamour revealer erases dark circles, brightens the dark areas around the eyes and blurs under-eye wrinkles and fine lines. As if that wasn't enough, its formula enriched in hyaluronic acid offers a long-term and lasting anti-wrinkles action. Results: Dark circles are reduced immediately after application for 77% of users. Wrinkles are decreased by 15% and eye puffiness is decreased by 20% after 4 weeks of use*. * Test performed with 22 participants who applied the product daily during 4 weeks. After fully moisturizing the eye contour, dab a bit of product under the eye with the applicator. Lightly tap with fingertips until the product is completely absorbed. Apply make-up after 5 minutes. MIB Complex helps eliminate puffiness and dark circles, thanks to its anti-oedematous, anti-inflammatory and veinotonic properties. HQA Microlens, newest generation of soft focus, fill in furrows and lines so that light is reflected off the skin homogeneously, visually erasing imperfections and illuminating the eye area. Oat Extract provides an optimal and immediate lifting effect. Encapsulated Hyaluronic Acid enables targeting of wrinkles and fine lines from within and plumps the eye contour for a long-term anti-wrinkles action. Urban Advance Complex, a powerful alliance of 3 active ingredients (shea butter serum, mint endorphin and probiotic sugar), acts as an anti-oxidant shield, neutralizing any cutaneous imbalances linked to pollution, strengthens the skin's natural defenses and shocks the skin back to life on a cellular level. with her lifted and firmer skin. Scent : Scent kind of alcohol still acceptable. because it is very smooth and flawless to her skin. available @ Pakson Sunway Pyramid ! Hеy theге! I know this is kinԁ of οff tοpic but I waѕ wondering which blоg platform are you using for this ѕite? Incredible! This blog looks just like my old one! It's on a completely different topic but it has pretty much the same page layout and design. Wonderful choice of colors! Superb site you have here but I was wondering if you knew of any community forums that cover the same topics discussed in this article? I'd really love to be a part of online community where I can get opinions from other experienced people that share the same interest. If you have any suggestions, please let me know. Appreciate it! Greetings! Very helpful advice within this post! It is the little changes that make the most significant changes. and that i could suppose you are knowledgeable on this subject. Fine along with your permission allow me to take hold of your RSS feed to keep updated with impending post. I've got some creative ideas for your blog you might be interested in hearing. Either way, great blog and I look forward to seeing it expand over time. yyou happen to be a great author.I will make certqin to booҡmark your blog and will often come bacκ iin tҺe foreseeable future. I wɑnt to encourage that you continue your great writing, havee а nice evening! could check this? IE still is the market leader and a large component to other people will leave out your wonderful writing due to this problem.